The latest cut from Heaven and Earth. 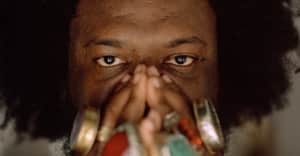 Kamasi Washington's new double album Heaven and Earth is dropping next month, and in anticipation, he's shared a new single. It's called "Street Figher Mas," and is inspired by the beloved Capcom arcade game. "Where the song really came from was me jokingly saying I was going to have my own theme song so that when I showed up to play Street Fighter, they’d play my theme song before I came in, like a boxer," Washington said in a statement. Listen below, and check out an A.G. Rojas directed visual above. Heaven and Earth is due out June 22 via Young Turks.